TSAILE, Ariz. — Diné College lost a pillar of the community when long-time educator and silversmith Martha Jackson died Jan. 16 at the age of 86. Lawrence Isaac, Jr., Ph.D., the dean of the School of Diné Studies and Education at Diné College, revealed the death to the college community. Isaac, Jr., who was Jackson’s immediate supervisor, said she will be bestowed the faculty rank of emeritus. 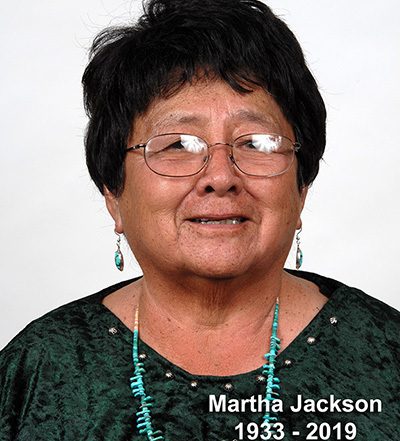 Jackson, A.A., M.Ed., M.A., a fluent Navajo speaker who grew up in the Seba Delkai area of Arizona, taught Navajo language, Navajo linguistics, Navajo descriptive and narrative writing, among other Navajo language-based courses at the college. She graduated with an associate of arts degree in Navajo-Bilingual Bicultural Education from Diné College back when the school was called Navajo Community College. The name change took place in 1997. Jackson went on to graduate from the University of Arizona with undergraduate and graduate degrees and obtained a second master’s degree from Goddard College in Vermont. Jackson started working at Diné College in 1970 and was an accomplished silversmith. She was also instrumental in curriculum development at the college — particularly courses dealing with the Navajo language. Vernon Jackson, one of Martha Jackson’s five children, said his mother passed away peacefully at Flagstaff Medical Center with loved ones by her side.